"Heaven comes to earth when you do what you do." I read it at first and was like, "Aw that's nice," but I want you to understand the magnitude of what he was saying to me because I didn't realize it on my first read. In many sects of the Christian faith, heaven is communicated as the culmination of all beauty, power and wonder. Heaven is awe-inspiring. It's allure is beyond our humanly senses. Then, you have earth, where we live, where we breathe, where we currently find our being. We are all on a journey to find that which makes our hearts sing. This is typically a long road lined with lots of trial and error, but, as we tread into the fog, the glimmers of light we receive often shine brightest. However, in our closeness to others on this journey, it's easy to get sidetracked by someone else's glimmer of light. We lose sight of the brightness in front of us and think their light shines brighter. That's when envy, disappointment, and, ultimately, unhappiness sets in. But my friend's text didn't say, "Heaven comes to earth when you do what someone else does." It said, "Heaven comes to earth when you do what you do." I love this. That awe-inspiring beauty, power, and wonder that is impossible for us to comprehend collides with our humanly realm when you set foot on the adventure meant for you. Don't worry that your adventure doesn't look like Sally's from your graduating class, or Mr. Mega Entrepreneur with a bajillion followers whose podcast you listen to daily. Somebody else's adventure isn't yours, and your adventure isn't somebody else's. 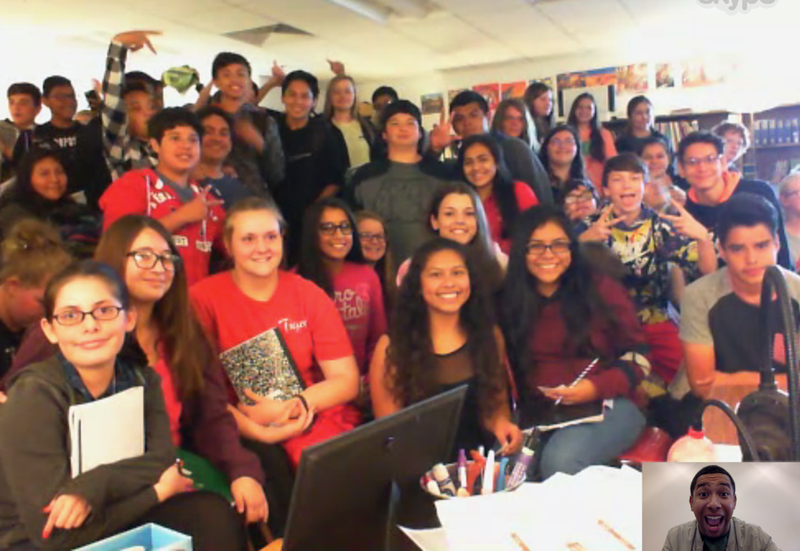 This past week, I had the pleasure of leading four Car Window Poetry workshops in person and via Skype with students in Canada, Colorado, Arkansas and New York – and what struck me is how amazing it is to see people do what they were born to do. I watched as third through eighth graders found their word – the principle they want to live by, or something they want others to see in them. I loved getting to hear words like "kind" and "creative," but I especially loved when I was visiting with students at Broadmoor Elementary School in Colorado Springs and my new friend, Senait, said her word was "thankful." After identifying what their word was, students got together with a partner and discussed what happens when they live that word out. Senait, who just so happened to be my Young Life area director's daughter, said she's able to make the most of any situation when she lives a life of thankfulness. That's from the mouth of a fourth grader. Incredible. Then, I also got to witness multiple teachers create kindness-inspiring experiences for their students. It was a privilege and an honor getting to see the magic they helped foster in their classrooms. After I spoke with 100+ eighth graders from Green Forest Middle School in Arkansas, one girl walked up to her teacher, Ms. Anderson, and said, "I can tell your heart is full of love for us and how much we loved this." Lastly, I got to spend time with Ms. Dressner, who works to share the message of showing kindness with her third grade students at EM Baker School in Great Neck, NY. 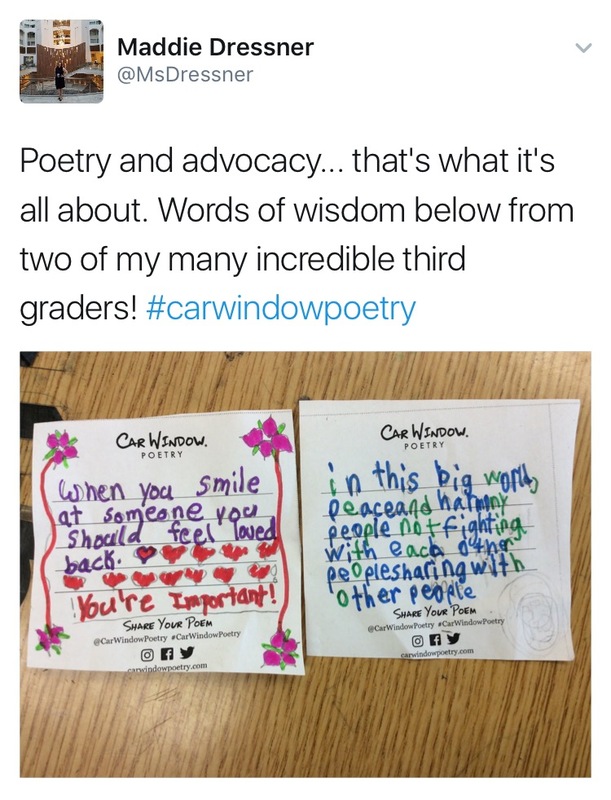 Earlier today, she posted her students' poems on Twitter and I was blown away by their words of wisdom at such a young age. I realize that I didn't give that to them. It's educators like Ms. Dressner who show up in kids' lives every day that help foster this kind of magic. It felt like heaven came to earth for me watching these students and teachers do what they do. What is it that you're made to do? Whatever it is, go do it. Then, while you're at it, tweet at us with your answer! I hope this has been helpful for you. If so, please share. Thanks so much for reading + showing your support!